Enjoy an out-and-back relatively flat course (fewer than 500 feet of climbing and descending). You'll admire the beauty of the surrounding desert as you follow this paved run from the Oasis Ranch along Hwy. 190 through the heart of Death Valley National Park, including a section through scenic Mustard Canyon. The entire course is below sea level with fantastic vistas of the surrounding mountain ranges: the Panamints, the Funerals, the Cottonwoods, the Blacks and the Grapevines. Your immediate surroundings are the exotic flora and fauna found only on the desert floor. This is probably one of the most unique courses you could pick for your next race. The desert is beautiful this time of year with mild temperatures; lows range between 30 and 40 degrees and highs hit the low 70s. The Death Valley Marathon™ and the Death Valley Half Marathon™ are trademarks of Enviro-Sports. 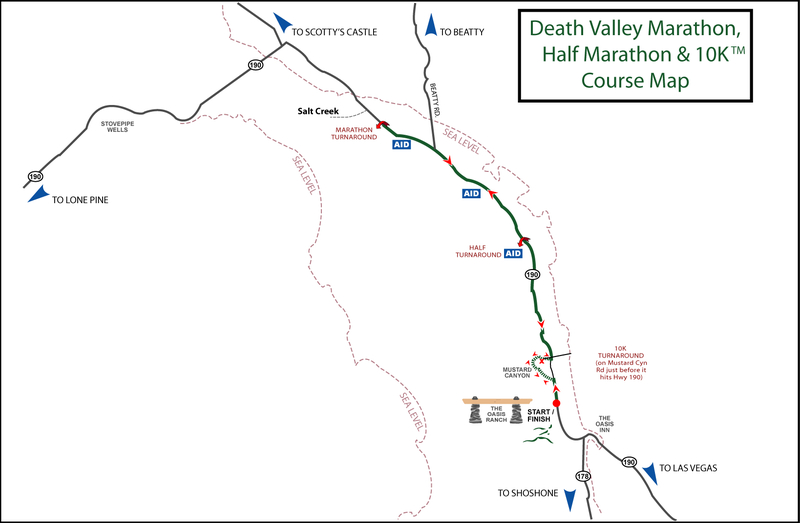 All courses are out-and-back along Hwy 190 through the heart of Death Valley, with a short detour off hwy 190 through Mustard Canyon within the first 3 miles. All races start and finish by the Day-Use Area near the Oasis Ranch. The 10K turnaround is at 3.1 miles, the Half Marathon turnaround is at 6.5 miles and the Marathon turns around at 13.1 miles. BIB NUMBERS: You will pick up bib numbers on race day morning during Athlete Check-in at a location by the Oasis Ranch. An email with all the race day details will be sent to all registered participants 1-2 weeks prior to event day. All race day details and updates are also posted below in the "Race Day Details" section. PARKING: is available at the Day Use area near the race start/finish. CANCELLATIONS: Registrations are non-refundable and non-transferable. If you email us by January 8, you may receive a rollover credit (the amount you paid minus a $20 fee) to use toward any future Enviro-Sports race. 6:45–7:45am: ATHLETE CHECK-IN You will pick up your bib # at a location near the Oasis Ranch. To receive your bib number and participate in this event YOU MUST BRING $10 National Park admission fee or proof of payment (i.e. a receipt from the Visitor's Center or a National Parks annual pass). If you have carpooled to Death Valley, it's best if you pay your fee at the visitor's center as you can both use the same receipt as proof of payment. Otherwise you will EACH have to pay the $10 park fee when you come to get your bib. 5:00pm: Informal AWARDS CEREMONY We will announce the overall and age-group winners at a location near the Oasis Ranch. It also gives you a chance to swap stories with other runners about the race. Personalized award plaques and ribbons will be mailed out 6-8 weeks after the race. IMPORTANT! If you are arriving late Friday night, please note the times that the restaurants and stores close. We will post updated information here as we have it. The area around the Oasis Ranch is under construction right now so times will be updated closer to race day. Discount room rates are available at the The Ranch at Death Valley & The Inn at Death Valley (formerly known as Furnace Creek Ranch & Inn) from Thurs 2/6/20 through Mon 2/10/20. These rates do not include the $12 resort fee nor the 12% tax on room rate and resort fee. Call 760-786-2345 and ask for Reservations by Monday 1/6/20 to reserve and give the corresponding discount codes. You cannot receive this discount booking online. You MUST call!